Information: The area between St George’s Bay and Bahar ic-Caghaq was a military area for several years. Catholic German war prisoners built a small chapel in the area. 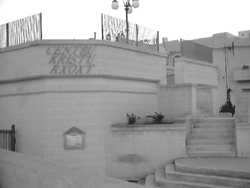 When the British Forces left Malta the area became a residential area for maltese families and plans were drawn up by Architect Richard England to embellish the chapel. When the Ta’ L-Ibrag pastoral area was established, Pembroke was attached to this area, but as the population of the area was growing continually, the Church authorities decided to create Pembroke as an autonomous pastoral area. A new pastoral centre has now been built and Pembroke became a parish on 8th December 2004.